Master Leung Ka-Dong has been working at Ying Kee Tea House for almost 40 years. “What type of tea do you usually order when you eat dim sum?” asks Master Leung Ka-Dong . “I usually order white hair peony because my family always orders it,” I reply. “Did you know that almost all restaurants mix their white teas with black to to add flavor and color?” he says. No, I did not know that. I didn’t know that it’s only in the recent 50 to 60 years that white, green and pu-erh have become Hong Kong’s most popular teas either. With a richer economy, Hong Kong people stirred away from simple black teas from India and Sri Lanka and began to enjoy tea for various health reasons or collect pu-erh tea like wine. Thanks to Master Leung, who has worked at Ying Kee Tea House since the early 1970s, I now know a little more about how to appreciate Chinese tea. Always drink tea during or after a meal. Our stomachs are acidic and tea is alkalizing. Acid and alkaline combined have a bloating effect. 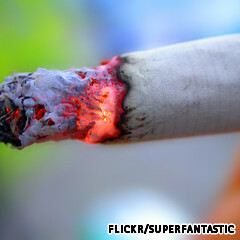 White tea is really good for the lungs and throat, so it is especially beneficial for smokers. A cup of white peony tea helps clear all the phlegm in our throats and cures coughs. Most restaurants mix white peony tea with black tea to add color and flavor because customers generally prefer tea that tastes richer and looks darker in color. Pure white tea itself has hardly any flavor or color compared to other teas. Genuine screw shaped green tea is the highest grade of green tea and the most expensive. 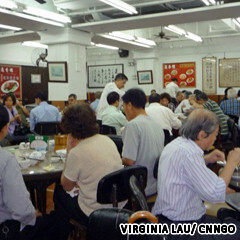 At Ying Kee Tea House, it sells at HK$5,067 per kilogram (HK$380 per 75 gram bag). Produced only in Jiangsu Province Dong Ting Mountain, it also the rarest green tea in China, producing only about 1,000 kilograms a year. It must be consumed fresh, within a year after picking the tea leaves. Screw shaped green tea of higher quality is best consumed within six months even. If it is tasteless, solvent or extremely bitter, that means it has already gone bad. Always pair oily food with pu-erh tea. 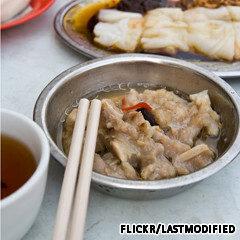 Dim sum, no matter steamed or fried, contains lard. 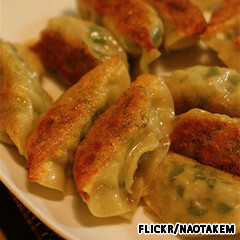 When you eat shrimp dumplings, there is always a piece of fatty pork in there to add flavor and fragrance. 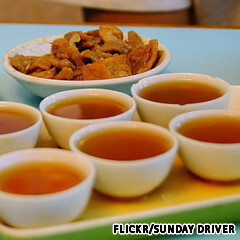 Pu-erh tea helps you rinse all the grease from the food out of your system. It aids digestion, blood circulation and lowers cholesterol levels. Sweet food is best paired with tea that is more bitter. 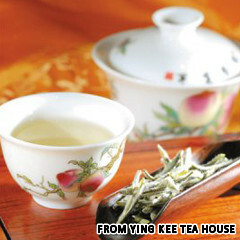 Loong Jing green tea helps moderate the sweetness of desserts. Like pu-erh tea, drinking green tea helps lower cholesterol levels and break down fat. will be difficult to maintain the same fragrance in the second brew. Spicy foods are best paired with Tie Guan Yin because it has a bittersweet effect. 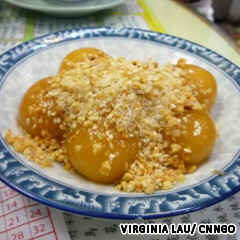 If you ever visit a Chiu Chow restaurant, they always serve Tie Guan Yin tea with their spicy dishes. Plus, Chiu Chow city borders Shantou city and Fujian province, which is known for harvesting Tie Guan yin leaves. Basically, any type of fried or deep fried food goes well with white tea. In Chinese medicinal terms, fried food is considered a dry hot. 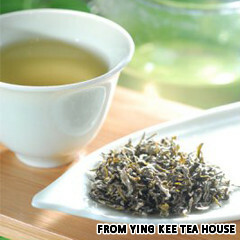 White teas like white hair peony help release body heat. Aside from pu-erh tea which is almost odorless, quality tea should always give off a fragrant smell. If you can’t smell the tea or or see that it is very solvent, then it has probably expired. It is simply not cost-efficient. 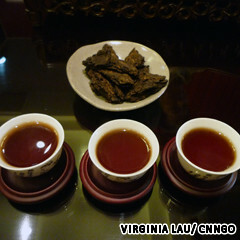 Pu-erh tea is like wine. The longer you store it, the richer it becomes. Storage for at least three to six years is optimal. 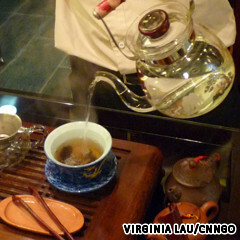 Regular pu-erh teas served at restaurants have generally been modified during the fermentation process to reduce storage time. By doing this, they lose whatever fragrance and flavor they originally had. 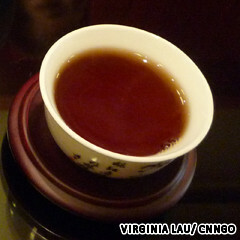 Good pu-erh tea should look very smooth and deep red in color, not black like regular pu-erh tea. You can also test the quality of your pu-erh tea by the stain it leaves on your cup after drinking it. If you see a stain surrounding the rim of your cup, that means you are drinking regular or low quality pu-erh tea. 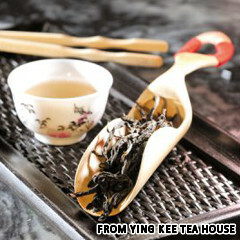 If your cup is left with no stain after consumption, you are drinking pu-erh tea of high quality. No matter which of the three you order, dim sum restaurants will serve you low grade daffodil tea. All three teas come under the same Oolong tea category, yet they are very different in flavor. Tie Guan Yin tastes more clear and fragrant. Oolong is stronger and more solvent. And daffodil is the purest of them all. Drinking tea is a matter of mood. And when I talk about mood, it mainly has to do with the condition of time. You’ve probably heard many rules about tea, from water temperature to color. But at the end of the day, drinking tea is a very personal experience. Some people like their tea boiling hot while others like theirs lukewarm. Some may like theirs stronger than others. So it’s all about time. We need time to brew that perfect cup of tea. Drinking green tea daily is one of the best health habits you can adopt. Studies have shown that regular consumption can improve the ratio between good and bad cholesterol, ease mild depression, and help prevent diabetes. Perhaps the greatest green tea benefit is the presence of polyphenol oxidase – an abundant supply of antioxidants. Antioxidants can be termed as the true elixir of life. One of the most encouraging recent studies, published in the September 13, 2006 Journal of the American Medical Association, found that among 40,530 Japanese adults followed for 11 years, there was a 16 percent lower risk of death from all causes among those who drank more than 5 cups of green tea a day compared to those who drank less than one cup daily. The activity of antioxidants in tea is more than that in over 21 fruits and vegetables.